Is Kik the Missing Piece in your Social Media Marketing? Have you heard of Kik? With over 240 million users, the free mobile messaging app provides a huge potential market for brands. For the most part, though, businesses haven’t started to investigate Kik. Many don’t even know it exists. Aiming to be the North American sidekick to China’s wildly popular messaging app, WeChat (whose makers just invested $50 million in Kik), Kik is proving that mobile messaging is the place to be for companies looking to reach a targeted audience. While it may seem like a labyrinth for marketers to navigate, Kik could become a new pillar of your social media marketing efforts. Below, we look at big brands that have already taken advantage of the unique features offered through the messaging app, and share insights that can help you do the same. Founded in 2009 by a group of University of Waterloo students, Kik has become one of the top mobile messaging apps available. Kik allows users to connect with others using a username rather than a cell phone number, to send text, video, images, sketches, and more through their Wifi or data connection. It also boasts an in-app web browser, so users can check out links and other social media accounts all without leaving the app, making it especially appealing for users as well as the companies trying to reach them. The future of any brand’s success lies with its longevity, so these companies want to be speaking to and resonating with their future customers or fans. Kik is the perfect social platform for this purpose as 82 percent of its users are between the ages of 13-24. This includes the over 40 percent of teens and young adults in the United States who use Kik. While it’s not surprising that a social media platform is being used by a younger demographic, the landslide of young people on Kik is something marketers should be paying attention to. Young people are flocking to messaging apps such as Kik and Snapchat in such great numbers because they want to talk to their friends without too much other noise interrupting the experience. With Kik, it’s possible for brands to engage without being perceived as this irritating noise, but it requires a recognition of the unique features the app offers. Using the Promoted Chat feature, brands are able to speak to their followers directly. More importantly, they are not just aimlessly broadcasting their message in the “spray and pray” method, but actually able to target and chat to fans in real time. Kik users can browse the ‘Promoted Chats’ section of the app to see what companies are currently offering promotions and/or campaigns, and then connect with them personally. For example, a user can strike up a conversation with NBC and ask what’s popular in the news today, and receive an answer as if chatting with a (well-informed) friend. As it would be impossible for marketing teams to individually respond to each interaction, Kik is using chatbots that use keywords to respond to every correspondence. The keywords used in chats will trigger responses, which basically enables brands to be invited into conversations. With digital natives used to interacting with non-humans such as Siri, the conversations are welcome as the user usually initiates when seeking something themselves, whether it be information or entertainment. It also helps that the conversations are on-brand, with companies such as Seventeen Magazine responding with many “LOL’s”, or, in the case of television networks, posing as one of their fictional characters. What is key with this feature is that users are consciously choosing who to interact with, which is one of the most powerful aspects of the messaging platform. No one wants to be interrupted by an ad while they’re trying to have a conversation with their friend, but with Kik they are interacting with companies by choice, in a way that is very similar to how they are communicating with their pals. Kik positions brands as being beneficial to their lives, rather than an intrusion, by allowing them the opportunity to connect in a way that is providing not only entertainment, but useful information to users. While it may seem counterintuitive for people to be seeking out sponsored messages from brands, Kik reports that over 90 percent of their users have done just that, the highest direct brand engagement in an app among those aged 14-25. To remain welcome in Kik users’ conversations, marketers have to find ways of being creative without coming off as pushy, or worse, trying too hard. It’s important for companies to know their value and keep their voice consistent, and many are utilizing Kik in creative ways as they do so. As the first NFL team to promote through Kik, the Indianapolis Colt’s recently showed the potential for marketers to exercise creativity while effectively reaching their current and future fans. 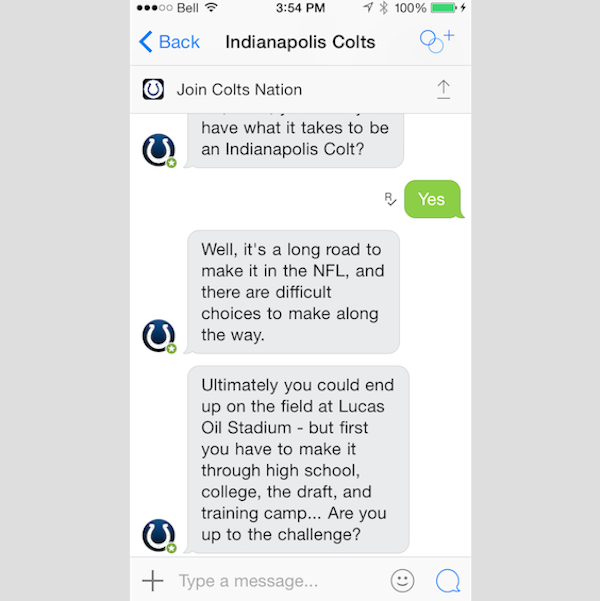 The Colt’s set their Promoted Chat up like a game, taking participants through a seven-level ‘choose your own adventure’ type of experience, where the user pretends as if they are trying to make it from a high school level of football to the big leagues. A text exchange takes place, with the participant’s answers determining the direction of the game. Further showing the possibilities of brands creatively targeting their audience, MTV turned to Kik when looking to promote The Woodies, their award show celebrating the musical tastes of college aged students. Through Promoted Chat, MTV would ask users about their favourite music, make recommendations, and share videos. They also sent out a link to the live stream of the award show on the day of, which allowed users to view it right within Kik’s built in browser. 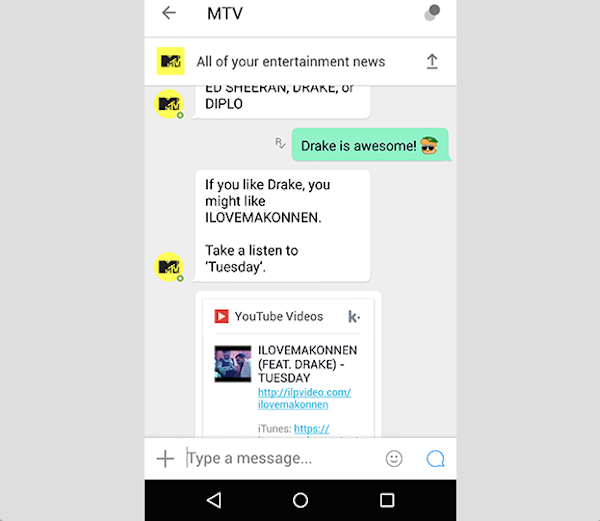 MTV counts the campaign a huge success, seeing over 170,000 unique chatters take part, with each person sending an average of 7 messages to MTV, and 4 percent of the livestream traffic coming directly from Kik. Another opportunity for brands to flourish their creativity, Kik’s newly integrated video ads system is proving successful for marketers. Offering users reward points in exchange for watching video advertisements, the system again rests on the key principle that when offered choices, audience members will react positively. One of the first brands to jump on board was sneaker company K-Swiss, who teamed up with popular DJ Diplo asking viewers to help act as advisors in the company’s comeback story. Users who saw the video reported 25 percent increased awareness of the K-Swiss brand, 80 percent brand favorability, and a remarkable 55 percent stated intention to purchase something from the brand. For a company that so desperately needed this boost, K-Swiss is discovering that Kik and the user-powered ad experience is a powerful tool.